Tel. 20 21 20 24. Jean-Claude Pressac visited the Auschwitz Birkenau State Museum at Oswiecim ten times between 1979 and 1984, and always used the archives concerned with the Hitlerite Auschwitz concentration camp at Oswiecim, and in particular those concerned with the Krematorien and gas chambers. The Museum granted access to the archives to the above named, according to his areas of interest and the direction of his research. The archives held by the Museum constitute part of the documents produced in the offices of KL Auschwitz and in SS institutions existing in KL Auschwitz. This also includes the documents of the “Zentral Bauleitung der Waffen SS in Auschwitz O/S.” They are authentic documents i. e. originals. 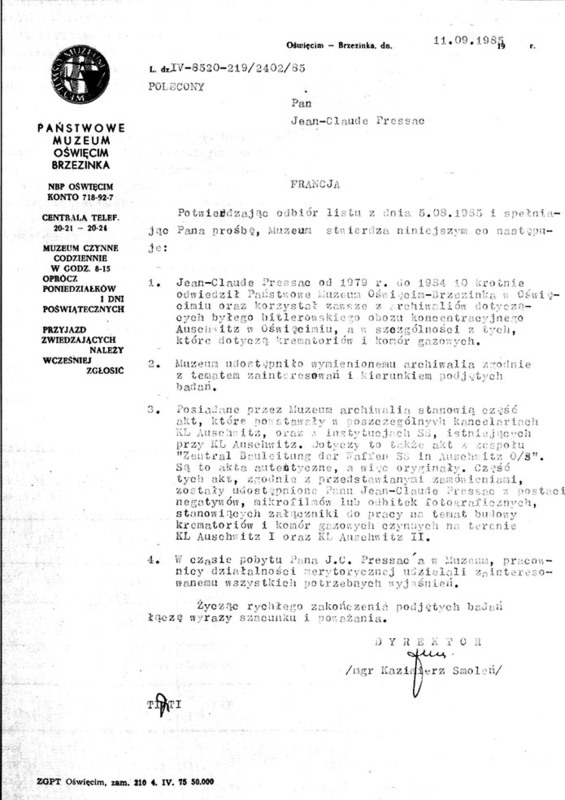 Some of these documents, in conformity with the requests made, have been made available to Monsieur Jean-Claude Pressac, in the form of negatives, microfilms, or photographic prints, constituting documents for his work on the construction of Krematorium furnaces and gas chambers operating on the territory of KL Auschwitz I and KL Auschwitz II [Birkenau]. During Monsieur J.C. Pressac’s visits to the Museum, the staff concerned with the activity in question provided him with all necessary explanations. In the hope that you will rapidly be able to complete the research you have undertaken, I convey to you, Sir, the expression of my respectful consideration. [*]The word “visitor” may lead to confusion. It is, of course, possible to “visit” the Museum in the normal way without arranging an appointment, but a researcher who wishes to consult the museum archives has to announce his arrival in advance, which is only normal. Access to the Archives Service and consultation of the documents, respecting normal practices, is free and requires no official recommendation other than simple prior request.